Accidents and illness happen on those family summer days out and when on holiday unfortunately. You trip and fall or you might get sun burnt. 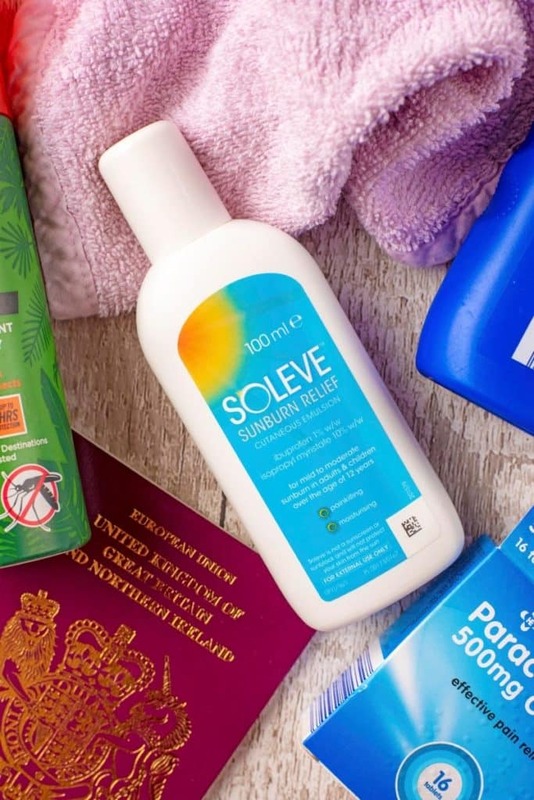 Having a well stocked travel first aid kit with all the essentials, like Soleve Sunburn Relief, is a must. Here is what we make sure we have in ours. As soon as you book your holiday, you start mentally packing in your head. How many shoes can I fit in my suitcase? Is 12 pairs of sunglasses too much? Can I live in a maxi dress and bikinis for 2 weeks? Whilst all of those are of course essential questions, don’t forget about your travel first aid kit too. 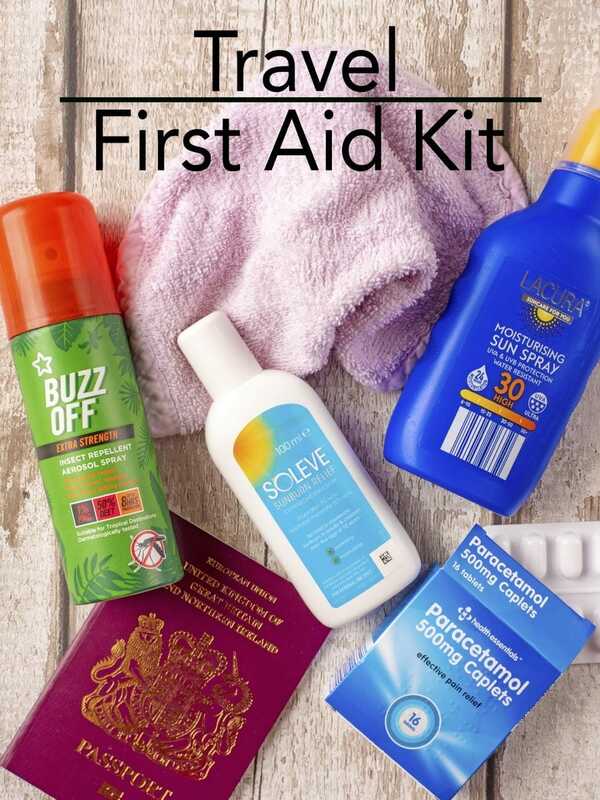 These are our travel first aid kit essentials and don’t forget, have a kit when out and about for those family summer day trips or short staycation breaks. An essential ingredient for any first aid kit. Who knows when the sun is going to strike in the UK (or do we now just live in a hot country after all the sun we have ben having?) and it is definitely something you need when on holiday in sunny climates and also at home. Opt for a high SPF and a 5 star UV rating. If you get a big bottle you can decant some into a smaller travel bottle that can be popped into a first aid kit. 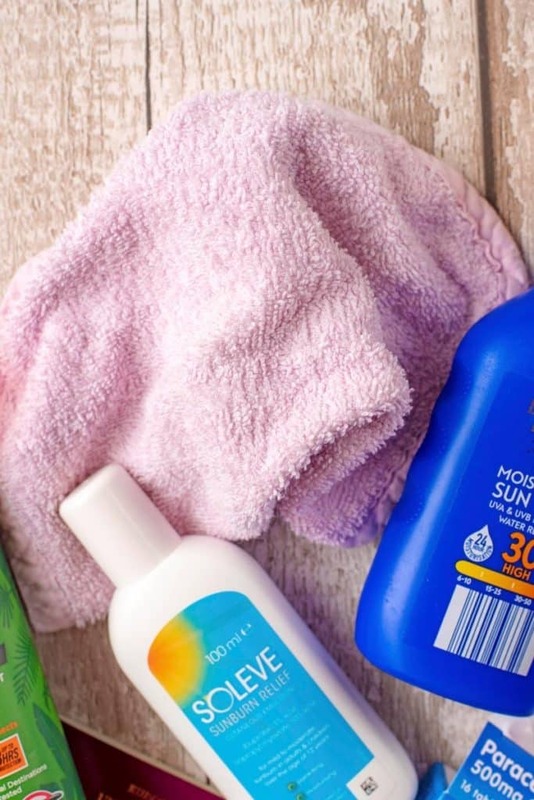 With the sun comes the risk of sunburn, anything from a slightly red face to full on sore to touch or move sunburn. Sunburn is never thought about until it happens, and once it does you reach for everything to try and calm it. 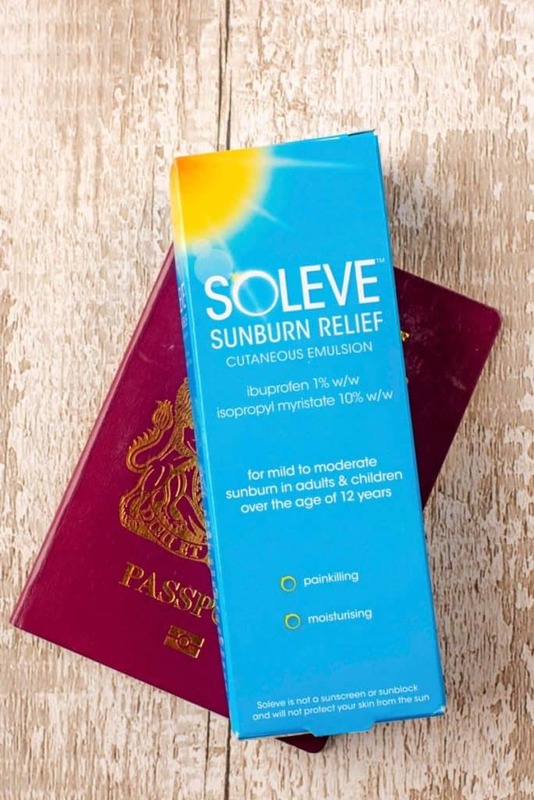 Keep Soleve Sunburn Relief in your travel first aid kit for mild to moderate sunburn – It’s the only licensed medicine of its kind to combine the painkilling power of ibuprofen with a soothing moisturiser to rehydrate the skin. If your sunburn is severe seek medical attention. Take a look at this handy “How Hot Will It Be?” map, to help plan your next trip. Holidays, and indeed even UK day trips, usually come hand in hand with some form of insect bite. 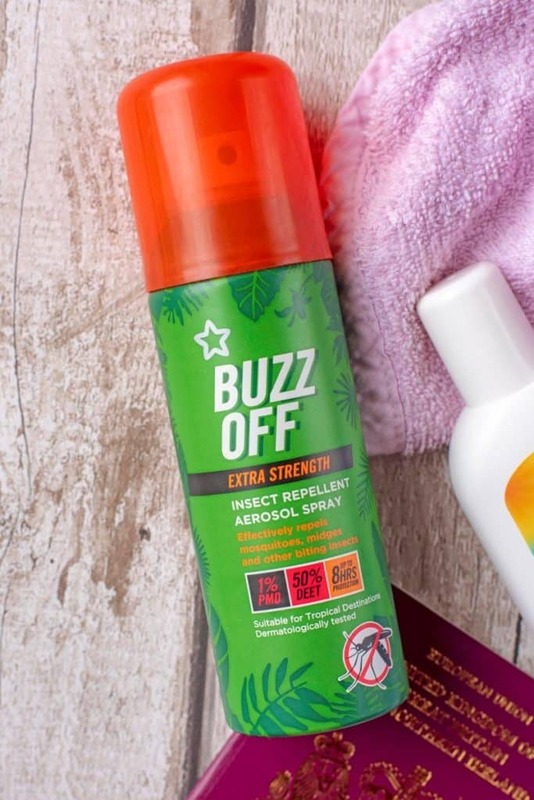 Take precautionary measures by putting insect repellent in your first-aid kit and if you are heading to an area known for insect bites make sure it contains 50% DEET. Remember, if you are abroad in a malaria area that you have your malaria tablets. Along with painkillers take some antihistamines tablets to help relieve the symptoms of insect bites or stings. We are as likely to suffer from headaches and niggles on breaks, perhaps even more as we are more likely to be active, trying new things out and overindulging. 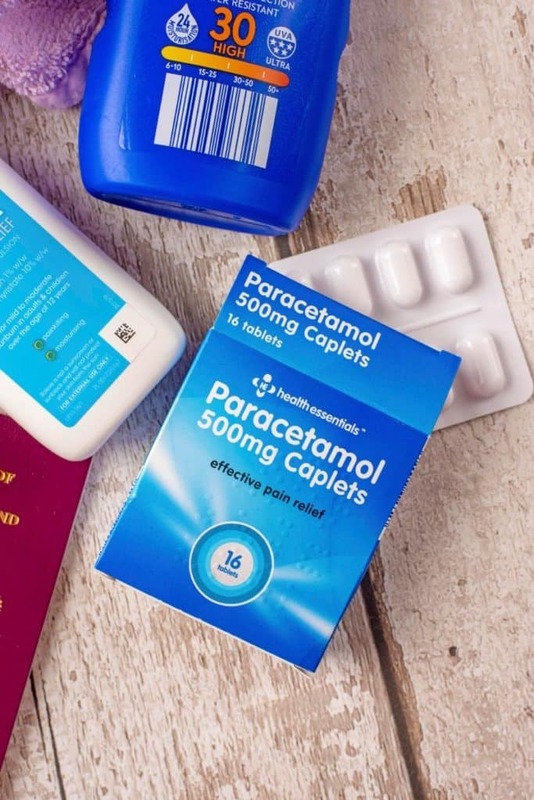 Pack some painkillers like paracetamol and ibuprofen so they are at hand and you don’t have to pay hotel shop prices. 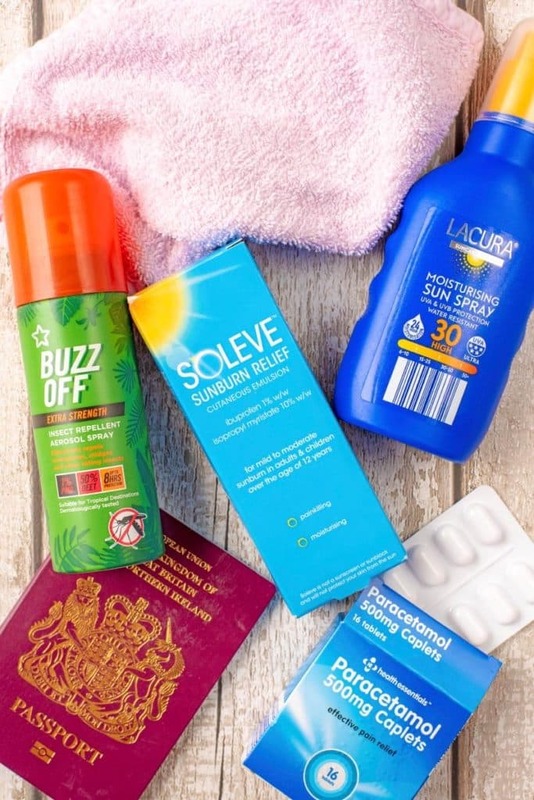 Not quite for inside your travel first-aid kit, but always make sure you have travel insurance for any trip. Otherwise you may face a hefty bill for medical treatment, that is sure to ruin your holiday! For more tips on sun safety take a look at 10 Tips for Staying Safe in the Sun. Do you want to be kept up to date on more posts like this? Please subscribe to the blog mailing list (it takes 30 seconds). You will get sent the new post and recipes straight to your inbox. Your email address won’t be passed on to anyone and you will never be spammed. Such a great reminder to bring sunscreen! I know it’s always something I forget as well as sunburn healing remedies. My husband is never too pleased lol. 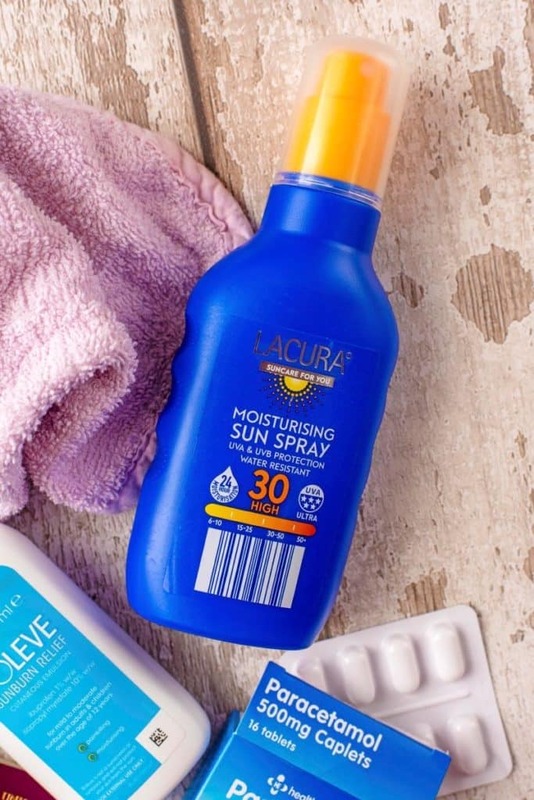 Such a perfect summer travel kit! It’s so perfect!